The R&S FSVA3000 is signal and spectrum analyzer that operates from 10 Hz to 4, 7.5, 13.6, 30 or 44 GHz. It has an analysis bandwidth up to 400 MHz and a SSB phase noise of –120 dBc/Hz at a 10 kHz offset. The analyzer can measure EVM values better than 1 % for a 100 MHz signal at 28 GHz. 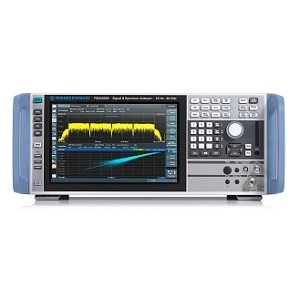 With frequency coverage up to 44 GHz, this analyzer is ideal for analyzing 5G NR signals. It can simplify troubleshooting rare events and setting up complex measurements. With the event based action GUI, whenever a predetermined event occurs the corresponding action, such as saving a screenshot or I/Q data, is performed.